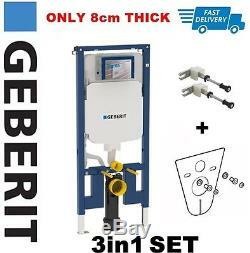 GEBERIT DUOFIX UP720 8cm WC TOILET FRAME H1.12M + WALL BRACKETS + WC BEND + MAT. REQUIRING A DEPTH OF JUST 8CM THE UP720 CISTERN IS INTEGRATED INTO GEBERIT'S DUOFIX 1.12M FRAME GUARANTEEING A RELIABLE AND SECURE FIT FOR WALL HUNG WC'S THE MINIMUM COVERING THICKNESS OF THIS NEW CISTERN HAS ALSO BEEN REDUCED TO JUST 10MM MAKING IT IDEAL FOR BATHROOMS SPORTING SURFACES RATHER THAN TILES. COMPLETE GEBERIT UP720 TOILET FRAME WITH SIGMA CISTERN AND ALL ACCESSORRIES. For installation in part- or room-height prewall installations. For installation in room-height installation walls. For wall-hung WCs with connection dimensions in accordance with EN 33:2011. 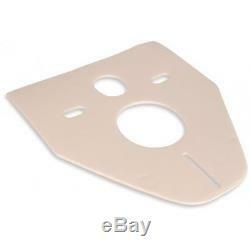 Suitable for wall-hung WCs with projection up to 70 cm. For single flush, dual flush or stop-and-go flush. For floor constructions 020 cm. Frame with ø9 mm drilling holes for fastening in wood frame construction. Frame suitable for ceramic WC appliances with small contact surface (with pressure-resistant wall covering). Leg support, zinc-plated, infinitely variable in height. Foot plate depth suitable for installation in U-profiles UW 50 and Geberit Duofix system rails. Connection bend can be installed without tools at different depths. Connection bend can be mounted vertically with front flush. Waste connector bend, extended, for connection in floor. Fastening for connection bend, sound-absorbing. Concealed cistern with front actuation, fully insulated against condensation. Cistern fulfils standard requirements in accordance with EN 14055, Class II. Immediate post flush possible with factory setting. Tool-free installation and maintenance work on concealed cistern. Water supply connection at the top, offset to left side. Protection cover box for service opening protects against moisture and dirt. Protection box for service opening can be cut to length, suitable for surface-even flush plates. Equipped with conduit pipe for feed pipe for connection of Geberit AquaClean shower toilets. Flow pressure 0.1-10 bar. Maximum operating temperature, water 25 °C. Flush volume, factory setting 5.8 and 3 l. Water supply connection R1/2, compatible with MeplaFix, with integrated angle stop valve and hand wheel. Protection box for service opening. Connection set for WC, ø90 mm. Connection bend 90° made of PE-HD, ø 90 mm. Adaptor socket made of PE-HD, ø 90 / 110 mm. SUPPLIED COMPLETE WITH ALL THE NECESSARY FIXINGS, INCLUDING A 90/110MM ADAPTOR AND WC DRAINAGE OUTLET BEND, THE GEBERIT UP720 IS QUICK AND SIMPLE TO INSTALON EITHER SOLID OR IN STUD WALLS. The item "GEBERIT DUOFIX UP720 8cm WC TOILET FRAME H1.12M + WALL BRACKETS + WC BEND + MAT" is in sale since Saturday, January 21, 2017. This item is in the category "Home, Furniture & DIY\Bath\Toilets & Bidets\Toilets". The seller is "emilakazikm" and is located in Hatfield. This item can be shipped to United Kingdom.